Football problem: 2 & 5 not indenfiying when they can move forward and create overload in the middle and attacking third. What: 2 & 5 not supporting the team to create overload. 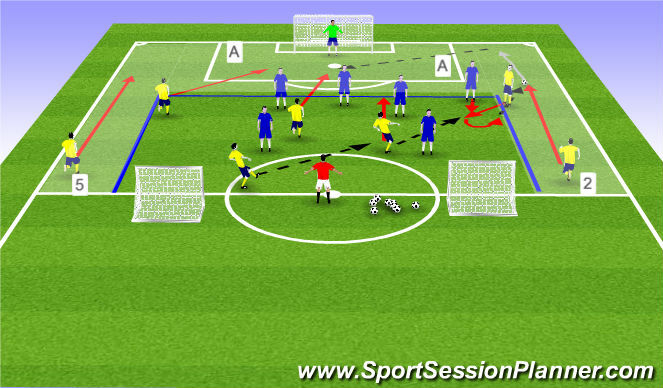 Session objective: To create attacking overload in wide areas. Set feild up to replicate positions 4, 5, 11 & 10. 4 to pass to 11, 11 to pass to 10. 5 to make overlapping run around 11. 10 to play ball out wide to 5. Blue Players are passive defenders. Players to perform dynamic stretch. Yellow team to start with the aim of play playing a pass to 2 or 5 who play ball to GK. If successful 2 x yellow move into Grid B to create 3 V 2 and 1 V 2 in grid A to play in opposite direction. Swap Bouncers / GK and 2 & 5 players every 3 / 4 minutes. 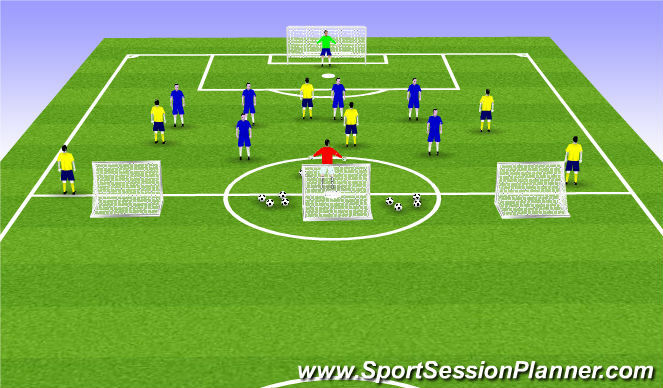 to pass the ball into 2 or 5 who are overlapping using combination play who play to GK to score a point. IF: your playing 2 or 5 time your run to stay onside. When: your playing 6,8,10 can you position yourself to take your 1st touch / Pass forward. 9: When you recieve the ball pass to a team mate who can play 2 or 5. Two teams in a 7 V 6 + GK configuration. Ball to start with the coach on half way. The Yellow team is to play the ball in to wide areas as quick as possible. 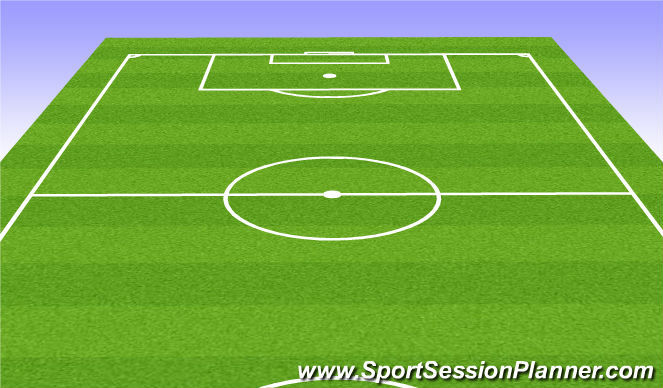 2&5 to start from half way and overlap 7 & 11 when the ball is played to the wide area on their side of the pitch. 2 x yellow players are allowed into Grid 2 & 5 while only 1 Blue defender is allowed. 7 & 11 can you play a forward pass beyond / dehind defenders into wide areas.If not pass to a team mate who can. 6 or 8 to switch point of attack when unable to play forward pass. 9. can you look to recieve pass from 8,10 and play forward pass. If not pass to a team mate who can. 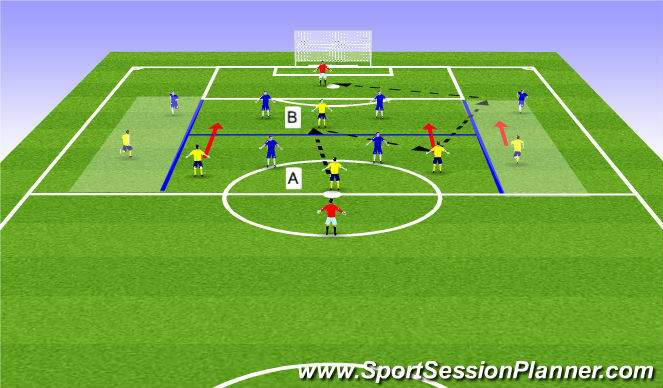 2 & 5: If your in a position to overlap 7 or 11 can you time your run to recieve pass in a onside position. 10 & 8 When in PB posisition youself to take your 1st touch forward. If unable pass to a team mate who can. 9. If you recieve the ball can play a forward pass. If not pass to a team mate who can. Red Bouncer plays No 8 for Yellow team and No 9 for Blue team. Play starts with either keeper or Bouncer.